Leading story on Guardian Australia’s Culture page. 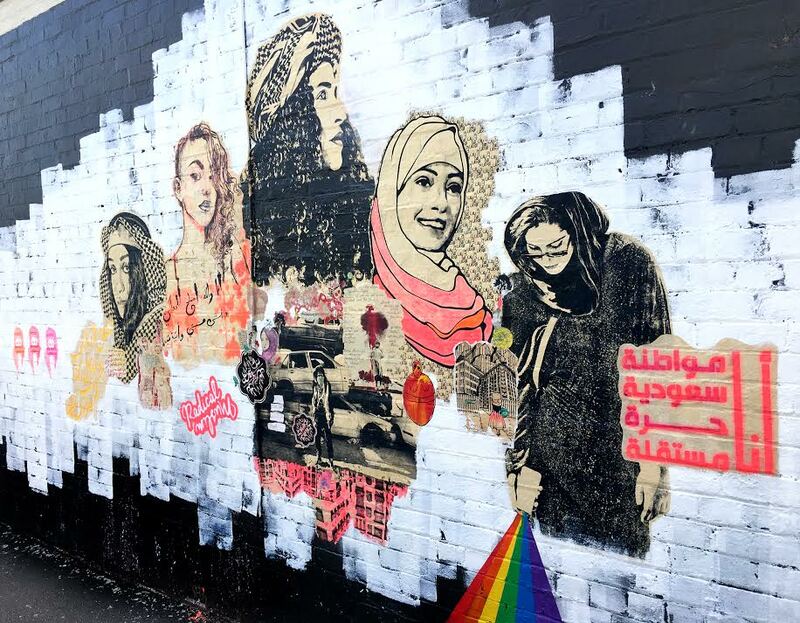 A Melbourne street-art mural featuring a Muslim feminist protest paste-up by prominent artist and activist Ms Saffaa has been defaced in an act of vandalism the artist has labeled a “personal attack on Muslim women”. 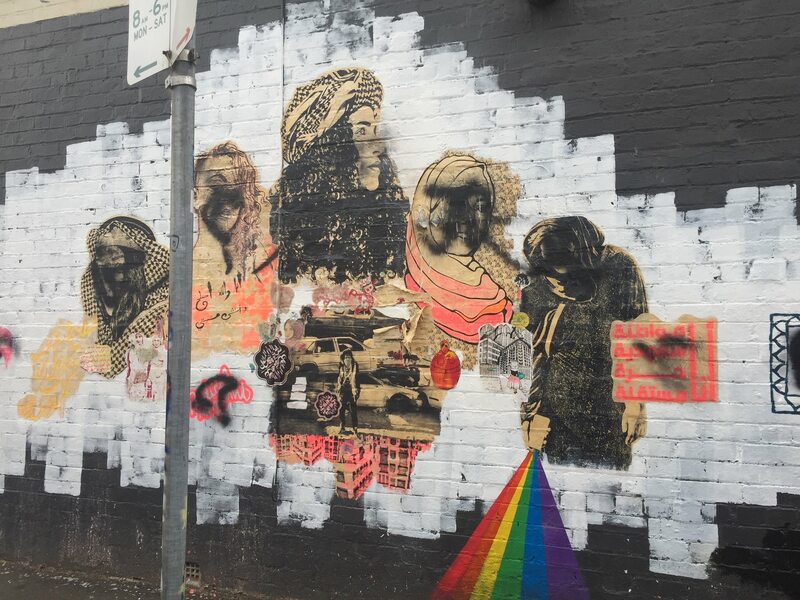 Featuring pictures of well-known Saudi activists and artists, women in headscarves, Saudi poetry and a pink stencilling of the words “radical Muslim”, the mural was defaced on Saturday night, with the faces of the women blacked out and the words painted over. The defaced mural. Picture: Hana Assafiri. Ms Saffaa collaborated on the mural with a handful of emerging and well-known female artists, including the American writer and artist Molly Crabapple. Saffaa said she believed the vandalism was fuelled by a political climate of rising anti-Muslim sentiment. The mural forms part of the #iammyownguardian campaign, a movement protesting Saudi Arabia’s guardianship system. Picture: Supplied. “I almost wanted to cry … it’s quite disheartening,” said Saffaa, a Saudi-Australian artist. She expected the work to be tagged by other street or graffiti artists, but says the extensive defacing had more aggressive overtones. The self-funded work, which went up in December, took months of preparation and ten eight-hour days to complete, she said. The mural forms part of the #iammyownguardian campaign, a movement protesting Saudi Arabia’s guardianship system which prohibits women from travelling, marrying or even leaving prison without the permission of a male guardian. Saffaa’s imagery – featuring a face shrouded in the Saudi shemagh – became emblematic of the movement. Crabapple said the work was a reflection of the complexity of the Muslim western experience that challenged conservatives on both sides of the spectrum. “I couldn’t decide if the perpetrators were Islamist misogynists, infuriated by the mural’s opposition to Saudi Arabia’s male guardianship system – or Islamophobic racists, infuriated by the mural’s depictions of proud Middle Eastern women and assertion of multifaceted Muslim identities,” she said. The original mural. Picture: Supplied. The mural is featured on the wall of Morroccan Deli-cacy cafe, run by feminist activist Hana Assafiri. Assafiri, known for hosting public salon-style conversations at her Melbourne restaurants, says she discovered the vandalism as she was opening the cafe on Sunday morning. “This is a specific aggressive act against the message of the mural,” she said. Assafiri, who employs only women, says vandalism in Melbourne’s progressive inner-city enclave highlighted her fears around security at the restaurant. She also expressed concern at the ripple effect from the election of President Donald Trump in the United States on local artists and communities, particularly the recent executive order barring Muslim migrants and refugees from certain countries from entering the US. Saffaa said she felt “heartbroken and drained” at the prospect of repairing the wall.